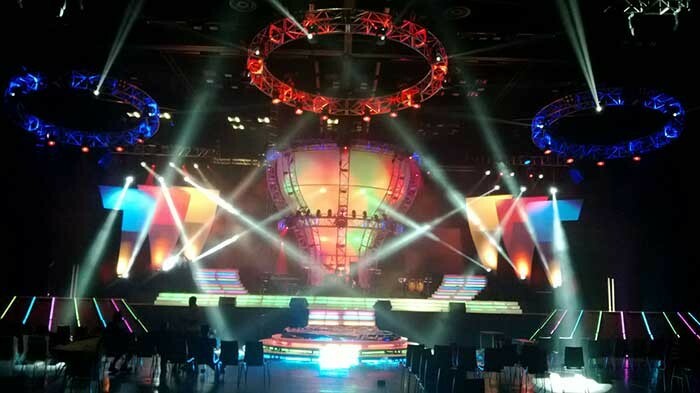 South Africa - Robe moving lights were right at the hub of the lighting action for the 2013 Crown Gospel Awards, staged at the Durban International Conference Centre (ICC), South Africa, and broadcast – live for the first time - by the South African Broadcasting Corporation (SABC), recognizing the best of South Africa’s vibrant gospel music scene. 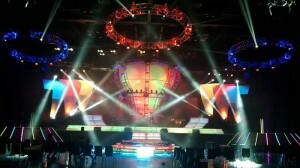 Lighting was designed by Ryan Dunbar from the Durban branch of Gearhouse South Africa, the country’s largest technical production rental facility. 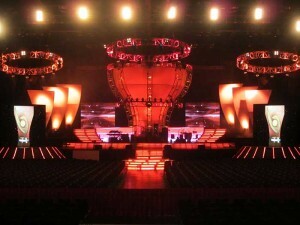 It was his first time lighting the event for which he was also the set designer, and in another first, he decided to use 80% LED sources for the lighting rig. These included 18 Robe DLF Wash fixtures, six DLS Profiles, 30 LEDWash 600s and 70 LEDForce PRs. He also used 24 of Robe’s new Pointe multi-purpose moving lights for beam effects, which helped create the spectacular ‘big room’ effect he was looking for. The stage was spherical in shape and the set design was futuristic and modern in appearance, based on a large trussing superstructure resembling a reactor with a core in the middle - also constructed from trusses - and representing extreme high energy. Inside of the core was a large light box mirroring the architecture of the trussing. Shiny finishes were used across the set to help bounce and reflect the light around the space, in turn producing glittering and shimmering effects and some interesting texturing. Ryan wanted to use LED for a number of reasons, one was to achieve a rich and bright look onstage, the second was to save time in focusing generic fixtures and the third was to put the latest Robe LED technology through its paces in a live TV scenario. Three circular trusses were installed above the presenter positions and these together with two 30 degree angled side trusses left and right of the stage and some floor mount positions provided the lighting positions of the 24 Pointes. He had been using Pointes for about a month before the Crown Gospel Awards and they are now his beam light "of choice". He likes the precision, the optics and the phenomenal output. "You notice a real difference in the quality of the beam and its focus is far superior to competitor products," he comments. During the show they were mainly used for impressive hi-impact aerial looks. He also remarks that being able to fit four Pointes into a single flightcase is extremely convenient for transportation and makes expedient storage. The 16 DLF Washes were utilized primarily for providing white light on the stage, for which they worked really well, and he had the additional flexibility of getting an array of strong colours out of them. The 30 LEDWash 600s were used as back lighting and to create ‘eye-candy’, rigged on the circular trusses and run in Mode 5 giving individual control over each ring of LEDs. The LEDForce PARs were used all around the set and for truss warming where they did a rock-solid job. Ryan has been using various Robe products in his work for about the last six years and appreciates the "quality, reliability and performance," of the brand generally. He took a calculated risk in using such a high percentage of LED fixtures for the crown Gospel Awards in that he did not have any additional generic white light coverage ‘in case’ on the rig from the FOH position. Rather, he relied solely on the DLSs and the DLFs to achieve the requisite levels … and we are pleased to report that they did the job really well!